Many of us are our own worst enemies. We want to please people, are motivated by a sense of achievement and so often find it hard to say ‘no’. Elad suggests you ask yourself these questions when deciding if you should say yea or nay. Does saying yes to an assignment relate to the team/organization’s goals? If not, talk with your manager about how to ensure your “yes” contributes to the greater good of the project or company. Will my efforts have an impact towards something important in the future? Will saying yes satisfy key people whom are important to your success? Pleasing others isn’t always a useful criterion when saying yes or no. Make the distinction between people pleasing to build alliances and pleasing others that turns into a never-ending job with little personal satisfaction. Will saying yes showcase your talents? When you recognize an opportunity to focus on your strengths, go for it. You’ll most likely be successful when you work from your strengths and natural talents. Click here to access full article. Making choices that help you gather your power to say “I won’t”. Bringing focus to what you will do by being clear about what you won’t do. Recognizing what stops us from acting on “a won’t” when it is the right thing to do. Learning to say no without coming across as stubborn or lazy. Try to get all the facts so that you understand exactly what is being asked of you before you respond. If pushed for a reason for saying no, keep it short and simple. The longer and more rambling your explanation is, the more it sounds like an excuse. When someone persists, perhaps rephrase your response slightly, but maintain your position. Try not to feel guilty. If you’re taking on tasks you can’t handle just to avoid feeling guilty, you’re not helping anyone. Keep your goals and priorities clearly and firmly front of mind. This will give you the self awareness and confidence to say “No” to less important activities. Remember that you are always saying “No” to something – if it is not to the current request, then it is to something else, which may well be more important! Even urgent things can keep you from making your best contribution on more important things, if you let them. 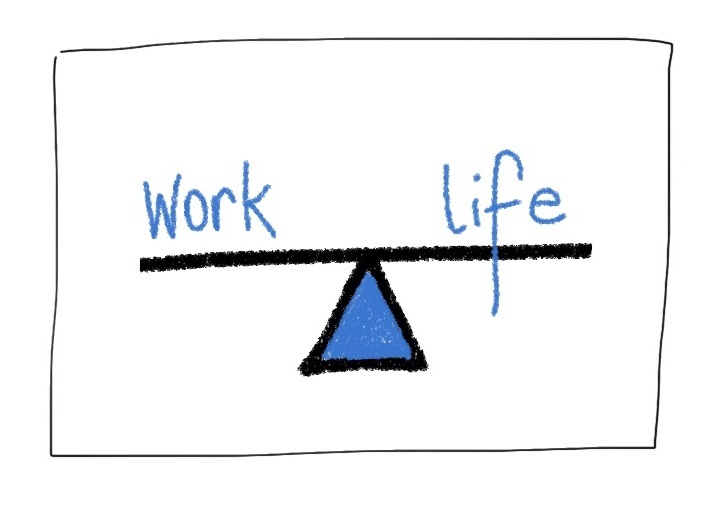 Let people you work with know when they are piling too much on and you are starting to feel stressed. Don’t try to do everything. Excel at just a few things, rather than being average at many. Sometimes saying yes can result in increasing requests for your time. Remember that others may take you for granted and even lose respect for you if you say yes to everything. Saying no doesn’t make you selfish. It means you are able to assert yourself and set boundaries for your time. A well thought out no doesn’t usually destroy a relationship. 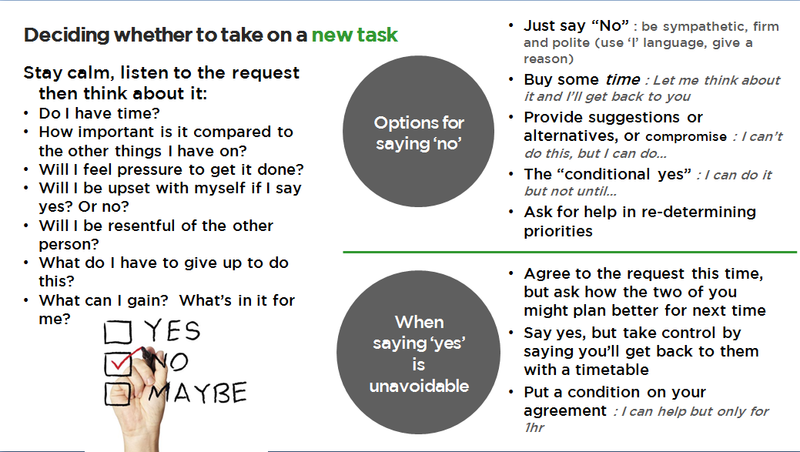 Can you say ‘yes’ to the person and ‘no’ to the task? What does this person really need? What are the priorities? Where is there flexibility? Is there another way for this person’s need to be met? At another time? By someone else? Is there a better way? Can I support the person to have their need met but not actually do the task myself? Who can I talk to? How can I follow up?